Updates for both Mac and Windows versions of Luminar 2018 are available now. Existing users simply need to: Launch Luminar 2018, on the Top Menu Bar choose Luminar 2018 > Check for updates (Mac), or for Windows, on the Top Toolbar choose Help > Check for updates. I've been running the Mac version without any hiccups on a MacBook Pro with macOS High Sierra. I have seen some reports from Windows users that they are getting error messages. I don't know how widespread that is. But if you use Windows and are on a mission critical assignment, I might wait a day or so to see what the issues may or may not be. Aerial Photography & Video with Matt Granger (worth $79) - World-renowned photographer, Matt Granger will share planning, shooting and editing aerial stills and video. Matt will also demonstrate editing with Luminar 2018 on his still aerial images. 119 Dramatic & Romantic Sky overlays (worth $29) - This is an amazing addition to your photo editing workflow, and will help give boring skies that 'wow!' factor. This is The Digital Story Podcast #630, April 10, 2018. Today's theme is "I Probably Could Have Done that Better." I'm Derrick Story. Allen Saunders wrote in 1957, "Life is what happens while you are busy making other plans." John Lennon later used the quote in his song, "Beautiful Boy (Darling Boy)". And any photographer who has ever hit the road knows exactly how this feels. In this week's podcast, I share how even the best laid plans can go awry when life intervenes. I hope you enjoy the show. The first story involves the Leica D-LUX Type 109 that I traveled with over the last two weeks. It all started during happy hour at Fleetwood's on Front Street in Lahaina. 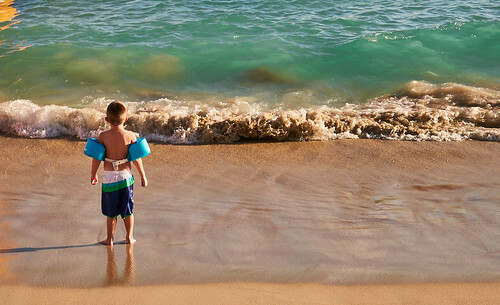 The next story happened during another happy hour at the Kaanapali Beach Club. We spotted two whales playing off the coastline. The third story happened while exploring a waterfall and pool on the road to Hana. I wanted a long exposure for the water, but had forgotten my tripod. DP Review reports that: Blackmagic has just announced its Pocket Cinema Camera 4K, a Micro Four Thirds compact camera that puts 4K RAW recording in your pocket for $1,295. The camera is a long-awaited successor to the original Blackmagic Pocket Cinema Camera of 2013, which offered 1080p RAW in a tiny camera body. Inside the Blackmagic Pocket Cinema Camera 4K is a 4/3 HDR sensor with 4096×2160 resolution and 13 stops of dynamic range. It has a dual native ISO of up to 25600. "The full size of the 4/3 sensor is designed to perfectly match MFT lenses so the crop factor is greatly reduced, giving customers a wider field of view," Blackmagic says. The Apple Photos Book for Photographers, 2nd Ed is now available on Amazon. If you purchase the book, send me proof, and I'll send you a link to my movie, "How to Organize Like a Pro in Photos." This offer is good until April 15, 2018. Use the Contact Form on The Nimble Photographer site. Also, feel free to post a review on Amazon once you've read the book. They're helpful to potential buyers. We have our cabin reservations secured for Sept. 27-29, 2018 for the Burney Falls and Lassen Volcanic National Park Workshop. Here's more about it. I'm hoping to send out reservation forms later this week. Road Trip Over - How Did it Go? I'm back! No more crowded airports, funky rental cars, or rotten WiFi connectivity. But what I do have is a library full of fresh imagery, 3 rolls of exposed film, and movie footage for our Patreon Inner Circle Members. Plus, I recorded and produced a podcast, published articles, and kept up with my moderation duties for the Skylum Photography Group. And I did all of that using only the contents in this bag. So, now that I'm back, what's the verdict? Well, all four cameras performed great. The Leica D-LUX produced fantastic images in a variety of lighting conditions. I relied on it heavily in Honolulu where I did a lot of street photography. I also took it hiking a couple times, and other than the limited reach of the 24-70mm lens, I thought it performed admirably. The Olympus OM-D E-M10 Mark II was perfect for those situations when I needed interchangeable lenses or that lovely tilting LCD screen. It was super compact with its 45mm f/1.8 lens that I often shot with using the 2X digital tele-converter. I also used the Panasonic 20mm f/1.7 prime quite often. Pictures look great! I forget how much I really like the Olympus TG-4 until I'm on a trip like this where water is everywhere. Whether I was in the ocean or hiking through a sudden rain storm, the TG-4 was there and ready to shoot. Plus, its geotagging feature really helped me stay on top of all the locations I worked. And finally, the Contax 159MM with Zeiss 28-70mm zoom was a real joy to shoot with during the second week. By then, I was already in an island frame of mind, and the film camera was the perfect fit for capturing the flavor of Lahaina and Hana. iPhone X with AT&T LTE - also serves as my Internet connection when hotel connectivity fails me. Apple iPad mini - With Verizon 4G LTE to give me access to a different cellular network than my iPhone. The typical accessories such as batteries, memory cards, backup flash drives, etc. At one point, we saw whales off the coast and considered jumping on a boat for a closer look. Briefly, I lamented not bringing a longer lens for that expedition. But as it turned out, the water was too choppy for shooting from a vessel, and we passed on the trip. So no harm done. But, I may want to revisit my long lens decision in the future. So, the bottom line is: I pulled it off. I had my bag with me on planes, trains, and automobiles, in restaurants, and in nature. And I loved it. What a fun (and successful) shooting adventure. I love the file organization and RAW processing in Capture One Pro 11. But once I have the basic image the way I want, I then like to move my favorites over to Luminar 2018 for the finishing touches. Here's an example from Maui. 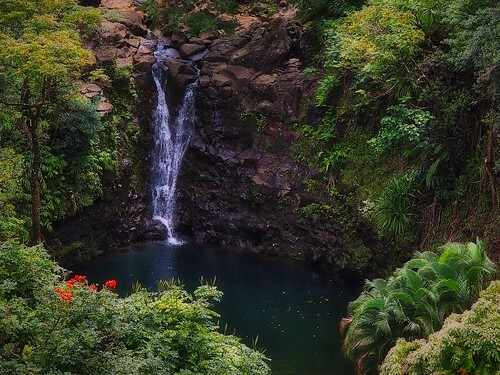 "Playing in the Falls, Maui" - Olympus OM-D E-M10 II with a Panasonic 20mm f/1.7. 1 second exposure with a polarizer filter. Image by Derrick Story. There are a variety of ways to do this, but I go the old fashion route by processing the RAW in Capture One, applying my basic edits, exporting a full resolution Tiff, then opening that file in the standalone version of Luminar 2018. I then save the working file as a Luminar document. When I'm finished with the enhancement, I also send an exported Luminar version back to Capture One Pro. Each application has its own strengths. And when you take the best from each, image editing becomes really powerful, and quite fun. This is The Digital Story Podcast #629, April 3, 2018. Today's theme is "Leica in Paradise." I'm Derrick Story. Exploring an island in the middle of the Pacific Ocean is definitely a place where I want to travel light. It's warm. It's humid. And flip-flops and board shorts are the apparel of the day. Feels like a good challenge for the Micro Four Thirds Leica D-LUX. And in this show, I'm going to tell you how it fared. I've become quite fond of the Micro Four Thirds sensor used in my interchangeable lens Olympus cameras. And I've been curious about its implementation in the Leica D-LUX Type 109 that pairs it with a DC Vario-Summilux f/1.7-2.8 zoom lens. This might be a good time to mention that the twin brother Panasonic LUMIX LX100 with the same lens is currently on sale for $597. The overall package is quite compact. And most other options that provide such a bright zoom are more bulky. So I thought to myself, "Could this be the right camera for a family vacation when dad is a serious photographer?" To answer that question, I packed the Leica for a spring break in Honolulu. As it turns out, it was a good call. I explain in the first segment of today's show. In addition to the image above, you can view an album of images captured with the Leica here. In apps such as Notability, Apple's Notes, and Procreate, though, the writing experience feels remarkably similar. I'd even go so far as to say that there's no difference at all, but I'll wait until I've conducted more "scientific" tests for the full review before making that kind of judgment. As a person who frequently writes on his iPad Pro as though it were a legal pad, I see little difference in casual practice. And for those of you who've always wanted to buy an iPad Pro just for the Apple Pencil but were scared away by the price, that should be very, very good news indeed. The new iPad starts at $329 (32GB/WiFi Only) and the Apple Pencil is $99. For a 128GB model with cellular + WiFi, the iPad price climbs to $559. When we work on an image and save it as a Luminar document, we have the option to revisit it later and "go back in time" thanks to the History popup. I find this particularly handy when I've over processed an image, or when I decide later that I want a different look for the shot. In both of those cases, I can peruse the History popup, find the place that I want to return to, then start a new direction. Take a look at this short video to see how this works. This feature is one of the benefits of using Luminar as a standalone app instead of as a editing extension or plugin. I tend to take advantage of History for documents that I want to spend more time on and get just right.